Our 6' Cotton Yoga Strap with D-Ring Buckle is the standard size yoga strap which will suit the needs of most yogis. 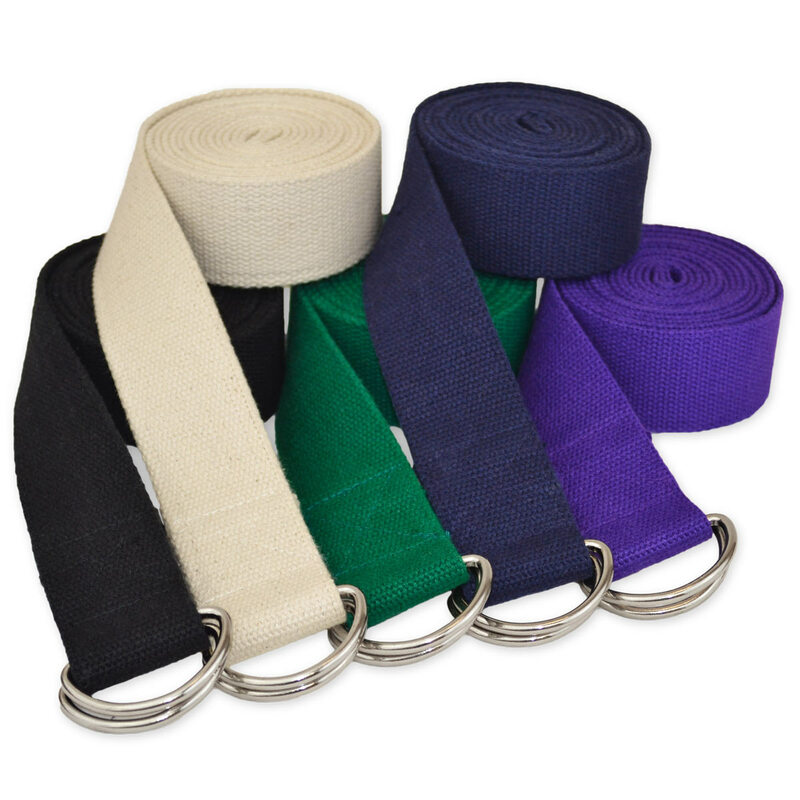 Our straps are made from durable 100% cotton and come in 5 versatile color options. The D-ring buckle on the end will keep your strap in place and is easy to adjust while holding a pose -- plus it will never bend or break off. Incorporating a yoga belt into your practice will help you stretch deeper into your pose and also will help ensure correct alignment. Our yoga straps are all 1.5 inch wide, which makes them easy to wrap around the hand or feet, yet wide enough to protect circulation. I purchased 12 of these 6ft straps in purple for yoga classes. They are hanging neatly next to the yoga mats. They are great and work perfectly. I have a bunch of 10 ft straps that are just too long and some 6ft ones with plastic buckles. I plan to replace them with more of these 6ft straps. Ordered 25 for my class and they use them all the time. Durable strap for a great price. These straps were exactly as described. Great quality and the price was perfect!!!! Shipping was fast too. Will def buy from Yoga Accessories again!!! This cotton strap is stout, but soft on the hands. Ideal for yoga stretches, both on legs and arms. I thought I ordered green, but somehow got black, Besides that love these belts- so easy to adjust and thay are very durable. My students are loving the new straps for their practise - no worries about arms being too short anymore - a great shoulder saver! great straps. no need to pay more or shop elsewhere. awesome customer service, too. Helped me when UPS messed up. Don''t shop anywhere else. These straps are unbreakable.